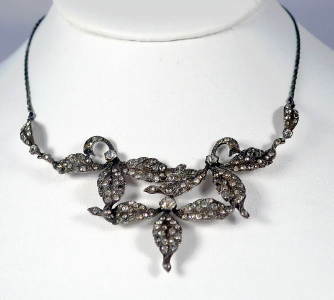 1910's vintage ART NOUVEAU open work leaf motif necklace. Patinated sterling and paste. Solid drapey overlapping leaf center piece with pavéd stones and two small pavéd extension links at either side. Flat double "S" link chain. Spring ring clasp closure. Marked on lowest leaf. All original, true 1910's era vintage, NOT a modern remake. Full length - 15 1/2"
Center piece - 5 1/2" X 1 5/8"
Excellent condition. Unpolished original patinated finish. Some stones are a bit discolored, consisitent with a jewelry of this age.